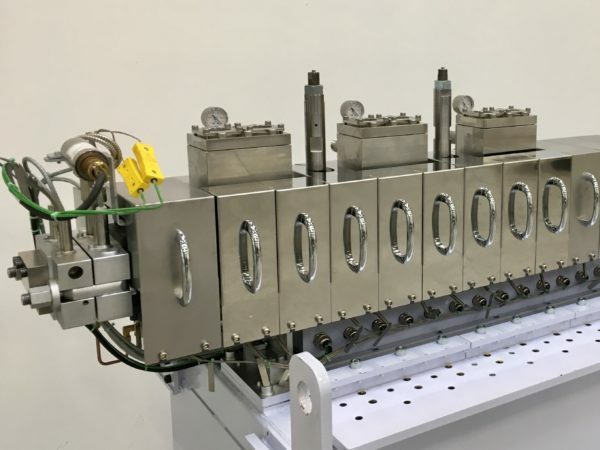 The ACHEMA exhibit: in hall 5.1 on stand D-47, The Japan Steel Works, Ltd. exhibits a special version of its TEX25αIII lab extruder customized for reactive and devolatilization processes. This particular model uses three long vacuum vent barrels for preventing the entrainment at the vacuum vent zone during devolatilization. Fundamentally, the TEX25αIII compounding range covers all general purpose/engineering plastics recipes and extends to super engineering plastics such as PEEK, PPA, PPS, LCP, PEI, and PI, also rubber/elastomer compound such as TPV. The TEX25αIII design allows the lab extruder to process material in all shapes and physical forms, e.g. liquid, powder, pellet, flake, chip, regrind etc. This makes the compounder ideal for research and development with frequent material and process changes, as cartridge heaters and a barrel clamping mechanism enable easy and rapid barrel section block changes., The total screw length/diameter (L/D) ratios can be selected from 42 with 12 blocks, 52.5 with 15 blocks, and 70 with 20 blocks. The machine accommodates vented or closed barrel sections and side feeding of abrasive reinforcements, heat- or shear-sensitive compound additives and materials into the melt via a downstream barrel section. Wear resistant LSP-2 modified tool steel screws and barrels in N60S nickel‑based alloy made by JSW promise long life of barrel and screw (high wear and corrosion resistance) for various kinds of compounds containing abrasive and/or corrosive materials and additives. TEX25αIII series advantages include a new gearbox design combined with enhanced gears and bearings, screw shafts and barrels as well as individual barrel temperature control. The result is a surprisingly high torque of up to 194 Nm per shaft (or 387 Nm in total) combined with wider processing windows as well as more aggressive kneading and mixing. Its torque density value is 18.2 Td i.e. reduced screw speed without reducing the throughput and keeping the temperature at an optimally reduced level. A standard torque limiting function disengages motor and gearbox to stop the screw rotation and protect the machinery. A low‑noise water-cooled motor is optional, as is direct drive instead of the standard V-belt drive in Europe. A TKD Twist Kneading Disc screw element with a twisted tip developed for energy-efficiency of kneading and mixing supports this “tip-clearance technology” by ensuring fast material conveying and relatively low material temperature while retaining appropriate mixing efficiency. 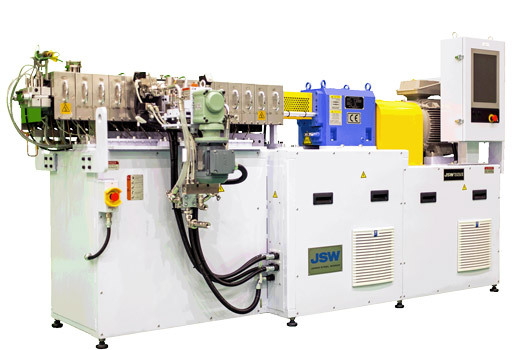 “Such features make the TEX25αIII the worldwide highest performance compact twin-screw extruder,” says Jun Kakizaki, JSW Europe General Manager since July 2016. JSW’s patented TEX-FAN Flow Analysis Network R&D support tool developed for TEX25αIII analyses polymer melt pressure, temperature, residence time and fill factor with special dedicated software developed by JSW. The TEX25αIII comes with JSW’s EXANET 64-bit RISC high-speed control system. Its 15-inch colour LCD touchscreen provides for easy operation, optimum process control and monitoring, storing thousands of operation conditions and process parameters. It integrates with auxiliary equipment, from JSW’s gravimetric feeders, side feeder, through to strand and underwater pelletizer units. The NIC special kneading barrel developed by JSW is in discussion as a possible option. It achieves good mixing/dispersion at repeated high-low shear rate and high viscosity for good compound material properties – without dead zones at the mixing zone through the introduction of several longitudinal grooves of particular geometry on the inside barrel surface for more screw‑to‑barrel clearance. Copyright © JSW. All Rights Reserved.